Burnley captain Bharat Tripathi is hopeful that Lancashire League history will be repeated as the title race goes right down to the wire. As the 2006 campaign headed in to the final day, Burnley faced the almost impossible task of overturning Bacup’s eight point advantage. However, inspired by captain and professional Jon Harvey’s unbeaten half-century against Haslingden at Turf Moor, as well as Michael Kelly’s four-wicket haul, they overcame the odds to be crowned champions. Burnley, who had England’s Jimmy Anderson in their side that day, with the country’s all time leading wicket taker contributing with 11 not out and 2-17, triumphed by six wickets while their rivals lost out to Enfield at Dill Hall Lane. “We’re looking forward to it,” said skipper Tripathi. 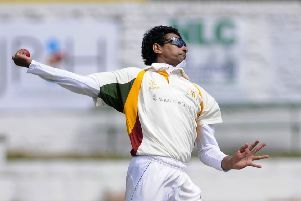 “We are involved in a proper game of cricket and fighting for a league title. This is the climax of the season. “We won the title in 2006 when we hadn’t been top of the league all season. “It’s been done before so stranger things have happened. “We’ve only been top of the league for one evening this time around but we’ve still got the chance to do it in our final game. “I think it was always going to go down to the wire. “We had to take the Haslingden game out of the formula because it was always a gamble. “There are quite a few permutations but at the moment it does lie in their favour. A decade on, the defending champions trail Ramsbottom by five points ahead of a clash with Todmorden at Centre Vale. The leaders, meanwhile, travel to Seedhill to take on third place Nelson. “We need Ramsbottom to lose the game really but we’ll just focus on ourselves,” said Tripathi. “It’s a difficult task but there isn’t any pressure on us. “The league is Ramsbottom’s to lose now, not our’s to win. We’ve just got to win our game and see where that takes us. He added: “To be fighting for the league trophy on the final day illustrates that we’ve had a great season. We just need to round it off properly. “We’ve not lost a league game since May so we need that unbeaten run to continue. It won’t be easy against Todmorden, though. “They are a decent side and they’ll make things much harder for us. We know that we’ve got enough to take them down. “Ramsbottom couldn’t be playing a better team from our point of view. Nelson are currently third and that’s a spot they’ll be hoping to defend. That would cap a fine season for them. “We played them last week and they’re incredibly eager and on their own ground they are a difficult side to beat. “Burnley Express” James Anderson is to return to Turf Moor for a special President’s match this month. From Friday the 16th to Sunday, September 18th, Burnley Cricket Club are hosting a Three-Day Real Ale Festival, which also includes a star-studded game, with England great Anderson playing, alongside a host of former international cricketers. The weekend’s main festivities are on Saturday, the inaugural President’s Day, where Burnley will play a 35-over game against Michael Brown’s President’s XI. Players will be selected from Anderson, and the likes of Graeme “Foxy” Fowler and Graham Lloyd (both Lancashire and England), James Foster (Essex and England), Jim Allenby (Somerset), David Brown (Glamorgan), Mark Harvey and Oliver Newby (Lancashire), Jonathan Clare (Derbyshire title winner) and other big names from around the Lancashire League. Popular former Burnley professional Jon Harvey is also scheduled to play. The game begins at 1-30 p.m. on Saturday 17th September. For non-ale drinkers, there will be a prosecco and gin bar, as well as all usual refreshments, including a barbecue and home-made food. Entry is free and all are welcome to what is sure to be a special weekend. The three-day spectacle will begin at noon on Friday 16th, and close on Sunday evening. The festival will feature a wide collection of ales from popular brewers including Worsthorne, Reedley Hallows, Elland, Marstons and more. There will be food available on all three days, including a barbecue on Saturday.